Former Nigeria U-17 winger Samuel Chukwueze hailed an 'unforgettable moment' for Villarreal after becoming the fourth youngest goalscorer in La Liga this season. The 19-year-old, who arrived at the club from Nigeria's Diamond Academy in August 2017, scored his first league goal at Rayo Vallecano on Sunday to help Villarreal claim a point. "This is an unforgettable moment for my career and I thank everyone for the opportunity and support," he said. 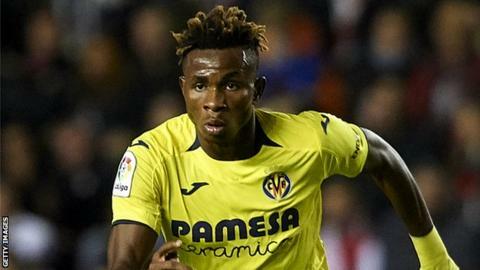 Chukwueze is enjoying a breakthrough season in Spain and his form has led to a maiden call-up for Nigeria's 2019 Africa Cup of Nations qualifier against South Africa this weekend. At 19 years five months and 20 days, he becomes the fourth youngest scorer in La Liga this season, behind Real Madrid's Vinicius Junior (18/03/22), Atletico Madrid's Borja Garces (19/01/09) and Huesca's Cucho (19/04/11). Chukwueze, who helped Nigeria win a fifth Under-17 World Cup in 2015, has now scored twice in six appearances for the Yellow Submarines - after opening his account against Rapid Vienna in this season's Europa League.